The first “wow” factor on our Silver Muse Caribbean cruise was, to our delight, the pepper grinder. Every table in every restaurant on the 600-passenger ship had a pair of tall, stainless steel salt and pepper mills made by Zassenhaus of Germany. Elegant and expensive, the ceramic-based spice grinders are considered among the very best in the world. First impressions when boarding the ship are of quiet elegance. Nothing garish, just muted shades of brown, tan, beige and cream. All 298 suites (no interior cabins) are generous in size. We had one of the smallest at just under 400 square feet including a large balcony but there was a comfortable queen size bed with excellent reading lights, a walk in closet, a sofa and plenty of drawers for storage. The flat screen TV was cleverly built into the main mirror. The bathroom, with both a shower (offering rain and traditional nozzles) and bath tub, was larger than on most cruise ships and presented a selection of top quality toiletries. We chose Bulgari. 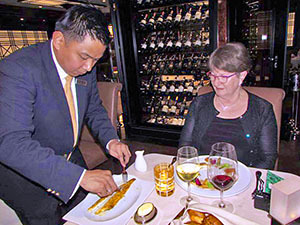 Silversea does cost more than traditional cruise ships but almost everything is included in the price – free wi-fi, many dining options, all wine and spirits plus all gratuities. Along with a staff-guest ratio of almost one to one, it represents a high-end value that’s hard to beat. No matter the dress code, the culinary choices at the eight dining venues are remarkable for a ship of this size. At the design stage, the company decided there would be no main dining room in the evening, just a series of top quality specialty restaurants. Some require reservations; others are “come whenever you like”. Throughout the ship the beef is of very high quality. 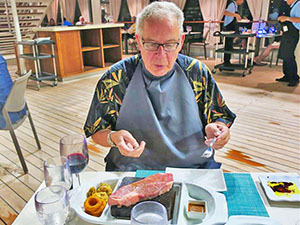 We particularly enjoyed Hot Rocks (open air, by the pool) where guests can grill their own beef, chicken or shrimp over a scalding slab of granite and Atlantide, a specialty steak house. 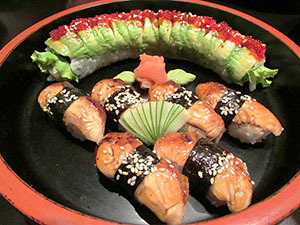 Indochine, an Asian specialty restaurant had a perfect mix of oriental dishes with spiciness from mild to searing hot. The complimentary Asian beer was a great fit. Silver Muse also offers a very high end 30 seat French restaurant under the prestigious Relais & Chateaux banner. La Dame is extra cost ($60 each) but, as Food and Beverage Manager Philip Van Tonder told us, it’s very exclusive with the highest quality of cooking and ingredients. The food and presentation were both excellent – we enjoyed foie gras, escargot on a crusty French baguette, lobster bisque, Burgundy-raised Charolais beef and Dover sole carved at the table – but the wine service was a disappointment. Only the standard house wines were offered and the sommelier didn’t seem as knowledgeable as the wine experts in the other, complimentary restaurants. Living by the sea, we’re always fussy about fish and were delighted by the quality of seafood served in all the Silver Muse restaurants. We were surprised to learn from the F&B manager that fresh fish was never picked up in various ports of call (health and quality control reasons) but came aboard as flash frozen. Clearly top quality. In fact, all the culinary offerings were high end and showcased the talents of the 68 chefs and cooks aboard. Our cruise was short, just six days, but we packed a lot into that time. 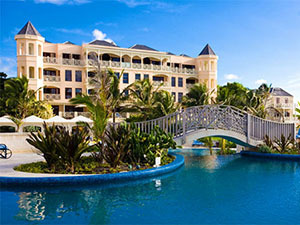 We began with an overnight in Barbados at the Canadian-owned Crane, the oldest continuously operating resort in the Caribbean. 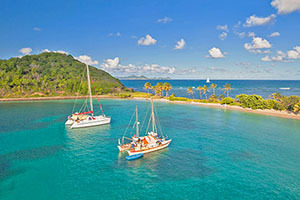 Its comfortable suites, ideal location beside one of the best open Atlantic beaches in the world and its excellent food (we ate at the Asian restaurant, Zen – the caterpillar sushi was a treasure) made a great pre-cruise stay. Our cruise ended in San Juan, Puerto Rico, one of several Caribbean islands still suffering from fall hurricane damage. But disembarkation of all the passengers was well organized and the smoothest we’ve had on any cruise. 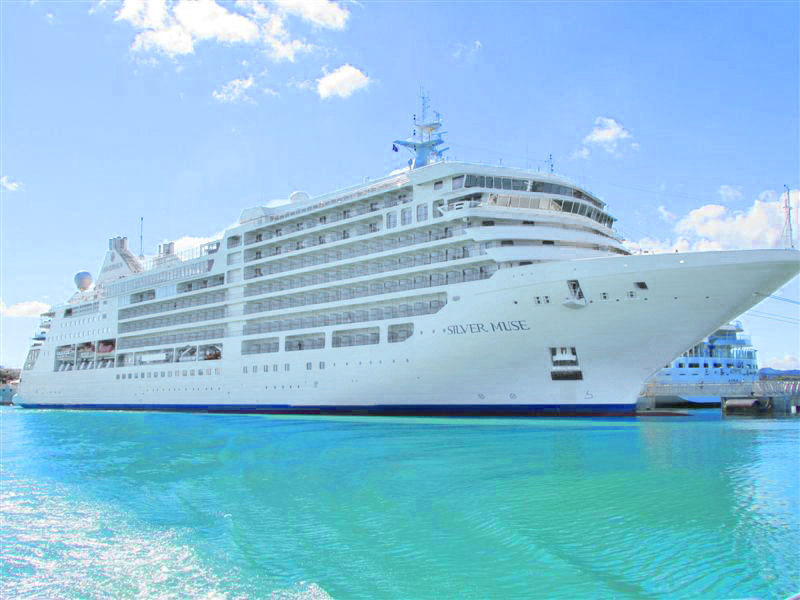 Another “wow” factor for Silversea.